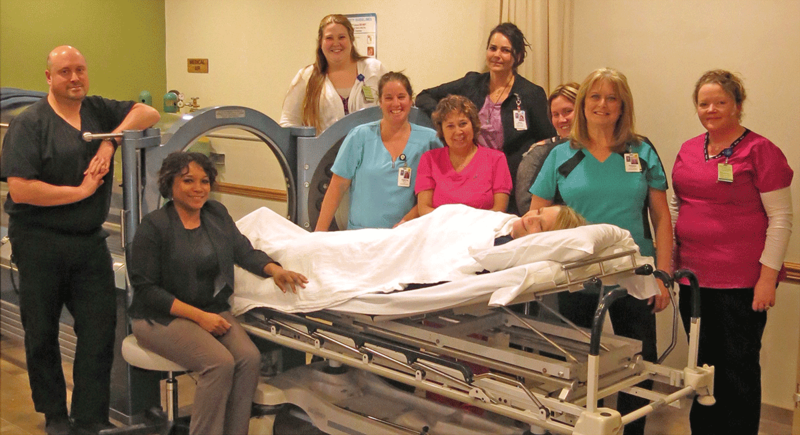 Shown in the photo from left are the team at the Patterson Wound Healing Center, Dr. Kenneth Brydges, Jamieka Rowe, program director, Kimberly Lemke, clinical coordinator, Tonya Shannon, RN, Paula Forsythe, RN, Julie Kreider, RN (in the bed), Amber Carroll, RN, Jenny Winters, hyperbaric technician, Kellsey Barr, office coordinator, and Kylie Corscadden, receptionist. OGDENSBURG — Claxton-Hepburn Medical Center’s Rev. Thomas T. Patterson Wound Healing Center has been given the Center of Distinction Award by Healogics, the nation’s largest provider of advanced wound care services. The Center achieved outstanding clinical outcomes for twelve consecutive months, including patient satisfaction higher than 92 percent, and a minimum wound healing rate of at least 91 percent within 30 median days to heal. There were 621 centers eligible for the Center of Distinction award and 423 achieved this honor. The Rev. Thomas T. Patterson Wound Healing Center is a member of the Healogics network of nearly 700 wound care centers and provides access to benchmarking data and proven experience is treating approximately 2.5 million chronic wounds. The Patterson Wound Healing Center offers highly specialized wound care to patients suffering from diabetic ulcers, pressure ulcers, infections and other chronic wounds which have not healed in a reasonable amount of time. Leading-edge treatments at the Center include negative pressure wound therapy, total contact casting, bio-engineered tissues, biosynthetic dressings, and growth factor therapies. The Center also offers hyperbaric oxygen therapy, which works by surrounding the patient with 100 percent oxygen to help progress the healing of the wound. No physician referral is necessary at the Patterson Wound Healing Center. Call 315-394-0426 to learn more or schedule an appointment.